Mumford & Sons have enjoyed a meteoric rise to the top of the music business in the last ten years since their inception in 2007. 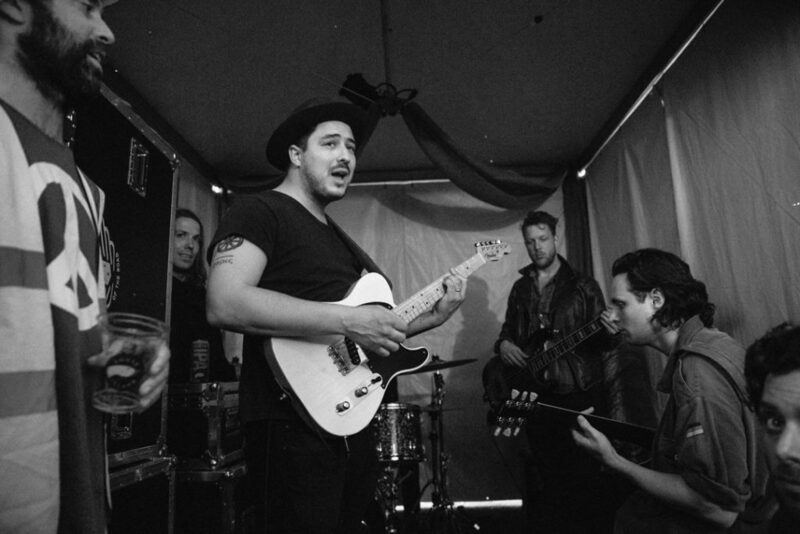 The group of English lads consisting of Marcus Mumford, Ben Lovett, Winston Marshall, and Ted Dwayne have managed to create an authentic American folk sound, and those who hear their music for the first time are usually surprised to find out that they don’t hail from the States. This is testament to the unique image they have created, and they have served to reinvigorate the Americana genre and inspire other bands to follow suit. For this reason, the Grammy and Brit Award-winning band have been selected to receive the Trailblazer Award at the UK Americana Awards 2018. One of the reasons why Mumford & Sons shot to fame shortly after their inception in December of 2007 was because the group were all multi-talented musicians who could each play a number of different instruments. The band’s sound also featured aspects that were long forgotten by mainstream music, such as banjos, mandolins, and resonator guitars. Although there was an emerging folk scene around London in the early stages of the band’s career, it was these sounds that set them apart from the types of bands that were dominating the charts in the late noughties, such as Arctic Monkeys and Kaiser Chiefs. As soon as June 2008, with help from Adam Tudhope who represented Keane and Laura Marling at the time, Mumford & Sons made their first ever Glastonbury appearance. They would later go on to headline the iconic festival in 2013 alongside The Rolling Stones and Arctic Monkeys. It was soon after Mumford & Sons debut album Sigh No More, which was released in October 2009, that people started to take note of this talented London group. The album featured Little Lion Man, which XFM’s Dave Berry said was his favourite track of the year, and BBC Radio 1’s Zane Lowe stated was the “hottest track in the world.” This, combined with excessive touring helped to make the band a household name. By the time Babel was released in 2012, the band had sold 2.5 million copies of Sigh No More, and the second album served to boost their fan base even further. In 2015, the English group released Wilder Mind, which shot to Number One on the Billboard 200 chart. It featured some great tunes such as The Wolf, Ditmas, and Snake Eyes, which cited on Betway blog is considered one of the of the top casino-themed songs in history, alongside the likes of Luck be a Lady by Frank Sinatra and Kenny Rogers’ 1978 hit The Gambler. The rest is history, and Mumford & Sons are now one of the most popular bands in the world. The reason why Mumford & Sons are now in line to collect the prestigious Trailblazer Award at Hackney Empire in London on the 1st of February is due to their incredible impact on the genre over the last decade. You would be hard-pushed to think of a mainstream record which featured the banjo prior to the London-quartet making the instrument cool again. Now there are numerous other bands cropping up and using similar features and sounds. Bear’s Den are one band that has clearly been influenced by Mumford & Sons. The London-based trio consisting of Andrew Davie, Joey Haynes, and Kev Jones initially funded their own tours and sold hand-printed CDs to fans. After supporting Mumford & Sons, Bear’s Den gained recognition, and their debut album Islands was released in October of 2014. Mumford & Sons have also helped pre-existing musicians reach a wider audience, after they brought folk music back into the mainstream. One such artist is Ben Howard, whose musical career began in 2009. It wasn’t until 2011 that he was signed to Island Records, though, and he can thank Mumford & Sons-mania for that break. His first album, Every Kingdom, made it to number seven in the UK album chart. Although Mumford & Sons have already received multiple accolades including a Grammy Award for Best Album with Babel, and the Brit Award for Best British Group in 2013, they are due some recognition for the major influence they have had on music going forward. When they step up to accept the Trailblazer Award next month, it will be much deserved.